These days, we frequently have a fantastic (fantastically dangerous) amount of fresh bread in the house. Mark is really perfecting this thing, and as official taste-tester, I’m happy to lend a hand in any way I can (it’s really a tough job…). In fact the only reason that this particular bit of bread made it to the properly stale stage needed for bread pudding is because Mark stood armed watch over it day and night… and he’s a big guy (no use trying to overpower him… believe me, I’ve tried). But luckily, thanks to Mark, the bread made it all the way to its destination… Super Bowl Sunday. So Sunday afternoon I baked it up into a nice bourbon apple bread pudding. And because I used a cheddar jalapeño bread, there were some tasty little extras in there (though because of the strong flavor of the apples and bourbon, you could easily skip over the cheddar and jalapeños and have just as great a result). Add a little ice cream and you have the perfect end to a perfectly gluttonous day. Lightly butter a 9-inch pie dish or small casserole. Arrange half of bread cubes in single layer in prepared dish. Melt 2 teaspoons butter in large nonstick skillet over medium heat. Add apples; sauté 5 minutes. Sprinkle with 2 tablespoons sugar; sauté until apples are golden, about 6 minutes. Arrange apples atop bread in dish. Top with remaining bread squares in single layer. Bring milk and cream to simmer in small saucepan. Whisk eggs and remaining 6 tablespoons sugar in medium bowl to blend. Gradually whisk in hot milk/cream, then vanilla, bourbon, and cinnamon. Pour over bread and apple mixture. Let stand until milk mixture is almost absorbed, occasionally pressing down on bread with spatula to submerge, about 30 minutes. 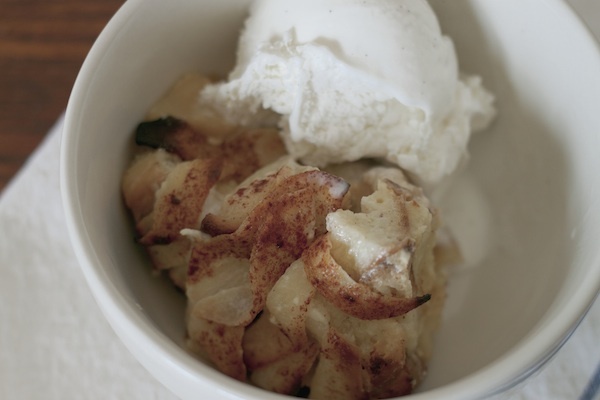 Soak smaller apple wedges in a bit of lemon and cream, then arrange on top of the mixture any way you’d like. Sprinkle with a dash of cinnamon. Place pie dish in roasting pan. Add enough hot water to roasting pan to come halfway up sides of pie dish. Bake bread pudding until top is golden and custard is set, about 40 minutes or so. If topping with apples, cover pan for approximately 30 minutes, then remove the cover for 10-20. Remove from water. 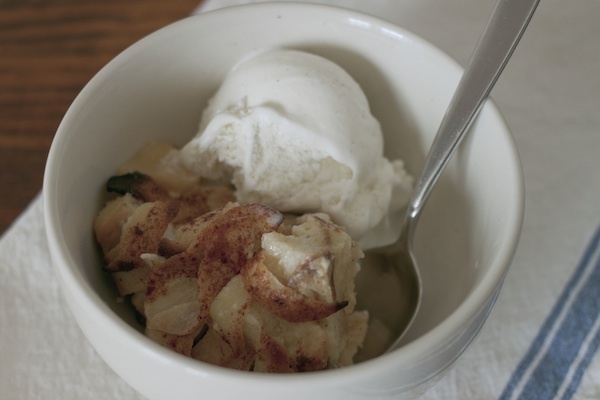 Serve warm or at room temperature with a generous helping of ice cream. Mix until fully incorporated, then allow the bread to rise at room temperature for around 2 hours. Refrigerate up to 7 days in a container that is not airtight. Preheat oven to 500 degrees, placing a baking stone on the middle rack and a shallow pan of water on the bottom rack. With a serrated knife, cut a baseball sized piece of dough from the stock and form into loafs. Mark formed baguette style loafs for this particular batch, but you can also do round or oval pieces, folding the top under as you form the dough. Allow the dough to rise a second time while oven is preheating (about 20 minutes). Place loaf (or loaves) on stone and quickly pour 1 cup water into the water pan. Close the door. Cook around 10 to 15 minutes or until browned. Larger loaves might need more time. HOLY DELICIOUS. MUST EAT THIS. seriously? i’m totally crashing your place next time you guys bake!! 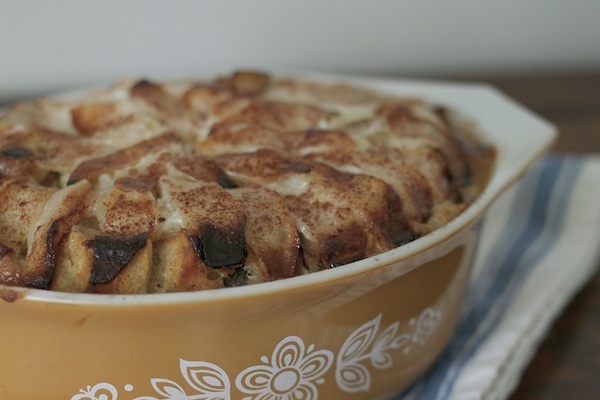 I have a complete weakness for bread pudding. And with bourbon? Yes please!